Sometimes, there is a bit of serendipity to my reading. The other day, I noticed that Troy Hicks and Bud Hunt (my friends from the National Writing Project) were hosting the Twitter-based #Engchat with Sara Kjader (another friend). I had not really meant to have enough time to jump into the conversation, but in a short stretch before reading to my son before bed, I watched the stream of chats about digital literacy and added a few ideas, too. I then left the conversation. The next day, I decided to check out the #Engchat hashtag and saw a note from Troy, thanking NCTE for allowing access to an article in English Journal that the three of them, plus Carl Young (another friend from the Massachusetts New Literacies Project), had published, entitled “Same as It Ever Was: Enacting the Promise of Teaching, Writing and New Media.” I was hooked first by the reference to the Talking Heads (see how important a title can be?) but then got intrigued by the article, in which the four of them scoured through the English Journal archives to determine whether mentions of Digital Literacy and Media had represented teachers moving ideas into practice in the classroom. Well, they found a good number of references to digital work and influence of media and technology on the lives of young writers, but not nearly enough articles about teachers actually using technology with their students. In other words, educators were noticing the shifts, but not necessarily taking part in it. And I would argue that still continues to this day, although I do believe that is slowly changing. But, not much has changed in the English classroom over the past 100 years. I appreciated the writers’ deeper look at the literature in this very influential journal, and also appreciate that some teachers are contrained by a variety of factors: budgets, access, lack of professional development, and uncertainty about where technology might lead them. These are all valid concerns …. and yet … and yet, our students are moving into such a rapidly changing world where critical thinking skills, connectiveness, and fluid, adaptable technology abilities will be in high demand. We can’t keep writing about the possibilities, we need to make those possibilities happen for our students. Carl, Bud, Troy and Sara leave us with a call for teachers to “not be afraid” of those possibilities, and urged us to “…fully embrace the playground of words and texts and ideas and the tools available to create and share them as our domain as language artists.” (73). This is your time, not tomorrow. We’ve just completed our expository/informational writing assignment, which allows students to choose topic of explanation and then write through the steps in clear, organized, logical writing. 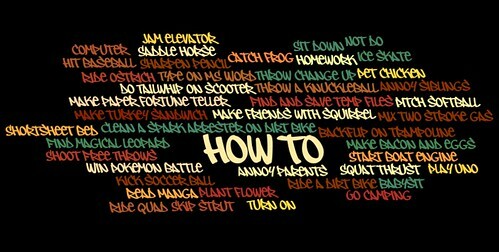 I’m always interested in what they choose as topics, as it can be serious or fun, or even imaginative. The word cloud above captures some of the topics of the assignment. This year, I shifted away from our narrative paragraph writing as I continue to make moves towards the new frameworks in our state, influenced by the Common Core. Next year, I’d really love to make this kind of assignment a more of a Maker’s Fair, with video tutorials on how to do what they are showing us to do, incorporating technology into the assignment in a meaningful way. I didn’t have my act in gear this year, but next year …. for sure. And so, Rick Riordan‘s The Kane Chronicles come to end. Well, maybe. He certainly left enough hooks in The Serpent’s Shadow to bring back his hero siblings — Carter and Sadie Kane — for more adventures down the road (more on that in a minute), but for now, Carter and Sadie have successfully saved the world from the Egyptian god of chaos – the shadow serpent Apophis — and restored Ma’at to the world. Just as Riordan is exploring Greek and Roman mythology with his Lightning Thief and Lost Hero series of books, here he delves deep into the lore of Egyptian magic and gods. My complaint remains the same: it gets confusing when he starts using the various gods. I have been reading this series and other Riordan series aloud to my son and we are constantly stopping and figuring out which god is which. Luckily for him (and for me), I had ordered through Scholastic books a Kane Chronicle Survival Guide. At first, I thought the guide was just cheesy, but it turns out it was invaluable for us as readers, as my son kept stopping me and grabbing the book, and finding information about the gods and magic and more. He’s only 7 years old, so I certainly encouraged these research moments. The writing in this series is not quite as strong as the other series Riordan is writing, but still, there is plenty of action, suspense and magic to keep my son interested. The narrator flips from Sadie to Carter, so we see the adventure unfolding through different eyes, and yes, we do learn quite a bit about Egyptian mythology and history. Early on in the series, my son and I made the predication that Riordan has some grand scheme to bring all of his series together: Percy Jackson and friends from The Lightning Thief series, Jason and others from The Lost Hero series, and the Kane kids from this series. And Riordan continues to plant those seeds with mention to the Kanes about “other magic” in the world soon to a concern. And my son (he’s seven, remember) made a connection between a character that seems to run through all three: the son of the god of the dead. Here, he is Anubis, but in the other two series, he is Nico. They seem to be the same character, with the same personality. So, who knows? We’re game to keep reading what he writes (The Mark of Athena comes out this fall — this guy writes up a storm!) and figure it all out. There were a lot of giggles and chuckling, and pointing, yesterday as I donned a fake mustache and fedora for our school’s Dress Up Like a Literary Character Day. I decided I would be Fako Mustacho, the somewhat-odd-villain in Tom Angleberger’s book, Fake Mustache, who rigs an election in an attempt to become president with the help of the mustache (you’ll have to read the book to figure that one out). 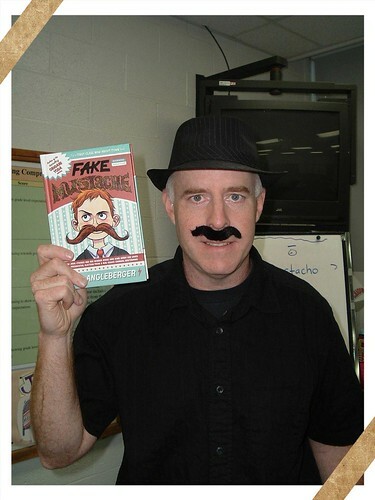 While not a single one of my students could figure out who I was (not one had read Fake Mustache), by the end of the day, all of them knew about the book (I had it on hand and showed it each of my classes) and I have a line of kids wanting to read it. (You’re welcome, Tom.) It was fun but itchy. I was happy to get it off my lip at the end of the day. I’ve been sharing out individual book glog projects from students over the past few weeks, and here is a the entire collection done as a Glogster Presentation. Lots of good books here, and lots of good thinking about characters and plot. If you use Scholastic book clubs, you might (like me) collect a lot of points. I use them to order books for the classroom, and it is well worth the bookkeeping it takes. 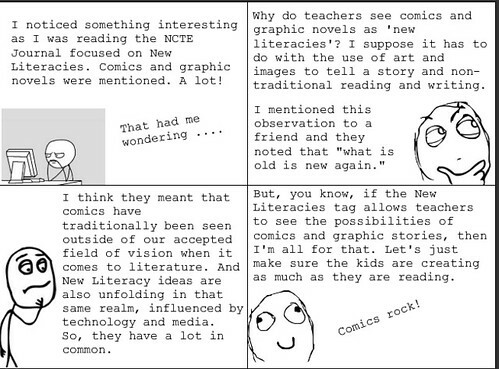 This year, I have been really trying to keep an eye on non-fiction or at least realistic fiction, knowing that I need to keep adding those kinds of texts with the shifts our state is going through with the Common Core. On our last order, this bundled collection of “I Survived …” books caught my eye (quick: cue up Gloria Gaynor … or Cake). Although I thought they were non-fiction (maybe I need better reading skills), the series is actually realistic fiction of survival. The bundle includes stories about shark attacks, the Titanic and Hurricane Katrina. 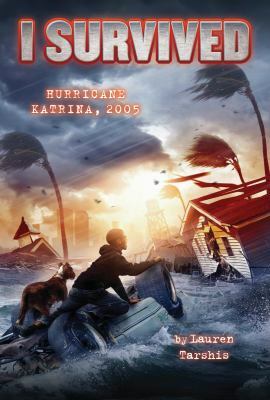 I decided to jump into I Survived Hurricane Katrina, just to get a taste of the story by Lauren Tarshsis. I liked it. While somewhat simple and perhaps lower reading level than my students are used to, the story of an 11 year old boy who gets separated from his family during the storm, clings to trees and debris to survive, helps rescue a stranded dog, and then himself is rescued by a good samaritan made for a fast-paced adventure story. I also appreciated the end notes by Tarshis, where she talks about the inspiration for the book (including her anger at the government for not protecting New Orleans and then not doing enough, quick enough, to help survivors) and provides lots of facts about Katrina and its aftermath. I could see a lot of research exploration around hurricanes, government policy and planning, survival and hardship, and more with this book.